I gave the horses the morning off yesterday. I tried not to feel guilty about it. The idea is to dial back the barn time. Since I am not training for the Olympics, or the regionals, or much of anything, why am I logging marathon-training amounts of time? Now that both horses are at a comfortable status quo, I need to find a more sensible way forward. Putting more into an activity than you get out is a sure way to burn-out. The amount of time does not matter, 6 hours a day is great if you are getting huge amounts of life energy back out of riding, gardening, or tiddlywinks. Five minutes a day is too much if it shrivels your soul. So, this is me walking away, when I can. Declaring a day off easy when it’s part of the schedule, say the day after a show, or when it’s raining cats & dogs and poodles are forming in one’s riding arena. A legitimate day off is harder to determine when the schedule is amorphous. Obviously, there are activities of daily living that need to be done: feeding, medication, etc. What about the rest of it? Mathilda needs to be groomed, but does she need a 30-minute head-to-toe every day? I’m sure she would enjoy it, but her hair won’t fall out if I skip a day. I should work with Rodney (see Tracey & Amy’s suggestions), but it’s hard to rally for seven days a week when the outcome is unclear. What is a good compromise between possible progress and sanity? Five days? Three days? Sure, fine, whatever. At what point does being gentle with one’s self slide in to sloth & self-indulgence? I have a liberal arts degree and lawyers in my genetic heritage, I can rationalize myself into a Harry Potter movie marathon quicker than you can find the remote. That’s why I like having a plan. If I make it up day-by-day, I’m suspicious of my own motives. I know myself. I’m a lazy sod. What is your day off policy? 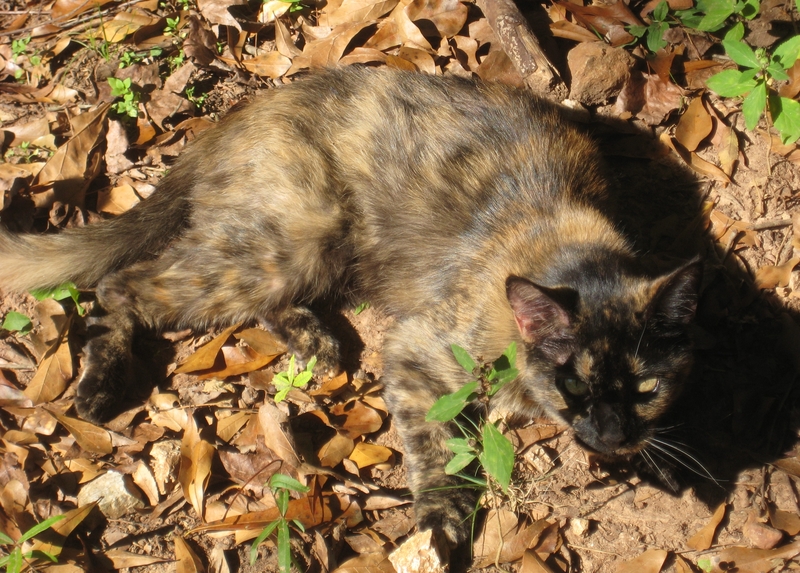 Our tortoiseshell being scenic in the leaves. Days off are good for us and are also good for them. If you are doing some kind of training, animals seem to use time off like we do – it solidifies things and sometimes they make leaps after that you didn’t expect. And it’s good for you too! Do not feel guilty! I am, however, with you on how easy it is to get too much in to that mode. How about scheduling one day off a week to start and see how that goes. Good idea, Amy. Setting a limit eliminates the fear of falling down the rabbit hole but still gives you time off. Which we all need – two or four feet. OTOH, when I need a break, I take one until I’m rested which is usually measured by how bored I get. When the energy comes back, I need to be “doing”. I’m impressed with the amount of work K has put into this. I would never have the patience. I take a day off when exhaustion or illness forces me. It is really hard to do it “just because.” Of course, I have a day job and deadlines, but I give those things way too much importance. Now with rehabilitative running–which might apply to horses?– I take two rest days for each running day in order to keep the arthritis from putting me back on crutches. In general, one big goal is to say NO to work and YES to what I decide to make important.